Perched on an outcrop of rock overlooking Buckfast Abbey is the shell of what was the Holy Trinity Church. Visit here on a sunny day and you will find it one of the most serene and peaceful places. All you probably will have for company are the jackdaws who nest in the walls of the church. Visit here after dark and you have another scenario. This is another church like Brentor, that when being built saw the intervention of the Devil who tried in vane to stop the villagers constructing a place of holy worship. In the case of this church, Satan was foiled by the building of a steep flight of 196 steps. As you walk up the main pathway you will find a huge building that defies description. Known locally as ‘the sepulchre’, this ‘penthouse tomb’ would probably be more suited to Colditz. If it reminds you of a prison then you are not far wrong because in it are the incarcerated remains of the Cabell family and in particular Squire Richard Cabell. If you peer through the heavy metal bars you will see a tomb with a gigantic white slab on top of it. The building and the heavy slab will give you a hint that we are not dealing with the normal family burial plot. It will strongly suggest that somebody is trying to contain something and there we have the legend. Squire Richard Cabell lived during the 1600’s and was the local squire at Buckfastleigh. He had a passion for hunting and was what in those days described as a ‘monstrously evil man’. He gained this reputation for amongst other things immorality and having sold his soul to the Devil. There was also a rumour that he had murdered his wife. On the 5th of July 1677 he passed away and was laid to rest in ‘the sepulchre’ but that was only the beginning of the story. The night of his internment saw a phantom pack of hounds come baying across the moor to howl at his tomb. From that night onwards he could be found leading the phantom pack across the moor usually on the anniversary of his death. If the pack were not out hunting they could be found ranging around his grave howling and shrieking. In an attempt to lay the soul to rest the villagers built a large building around the tomb and to be doubly sure a huge slab was placed on top of the grave to stop the ghost of the squire escaping. Even after taking these measures people have reported a strange red glow emanating through the iron bars. Other folk have reported seeing a whole host of demonic creatures gathered around the grave trying to get the promised soul for their master. The ‘penthouse’ tomb of the Cabell family. Below the church are a system of caves which run for about 3.5km. In ‘Reed’s Cave’ is a weird natural formation known as the ‘Little Man’, this has been formed by the joining of a stalactite and a stalagmite. The figure is said to resemble a human figure in seventeenth century clothes. Unnervingly this formation has been calculated to lie directly below the tomb of Cabell and can be seen in the picture below. It is also said that if you run around the ‘penthouse’ tomb seven times and then stick your hand through the iron bars, either Squire Cabell or the Devil will bite your fingers. Other stories pertaining to Cabell are that he rides in a coach led by headless horses driven by a headless coachman. This legend is fairly unique for a church but the stories don’t stop there. In the nineteenth century the graveyard was apparently a frequent target for body snatchers. Its secluded location and a convenient lane made it the ideal spot. Things don’t even stop there, in 1884 the church was restored and the work included renewing the spire which had been truncated by a previous lightening strike. On Tuesday the 8th of May 1849 arsonists broke into the church and started a fire which destroyed the vestry, part of the roof of the north aisle, the parish chest and badly damaged the communion table. During the Second World War some of the stain glass windows were shattered by the blast from German bombs which fell nearby. Just when you think things can’t get any worse we jump forward to the 21st of July 1992 when sometime around midnight the church was broken into and a fire started under the altar. This time the inferno completely gutted the church. The biggest problem that the fire brigade faced was that the nearest hydrant was a quarter of a mile away and the fact that the water had to be pumped uphill, it took a relay of thirty eight 70ft connected hoses to get the water on site. The fire was so intense that the heat literally blew apart the old Norman font. Although never proven, blame for the fire was placed at the feet of ‘Satanists’ and Devil worshippers. For hundreds of years it was thought that black magic rites had been carried out at the church and the Squire’s tomb in particular. The building which houses the tomb has a solid wooden door at the back, this had been placed there to deter Satanists from gaining entry. An early postcard of the church. How many churches can list such an unfortunate catalogue of events? The building today stands as an empty shell and testament to the possible fact that even today ‘evil’ is at work. If you stand at the back of the church and look out over the splendid view you might see a clue as to how and why the church has evolved. Your eyes will immediately be drawn to the magnificent edifice of Buckfast Abbey sitting below. This clearly has been the centre of an ancient monastic landscape since it was first founded in 1018. The view of Buckfast Abbey from the Church. However, in 2002 a trial archaeological excavation led by Sam Turner and Dr. Andrew Reynolds revealed what is thought to have been three Anglo Saxon burials. These were found along with a semi circular apse and foundations of a possible earlier church within the walls of the medieval structure. Early thoughts are that there was an early Christian Anglo Saxon church on the site and that it was possibly the predecessor to Buckfast Abbey. The style of the Norman font may also point to an early church although this may have been brought from elsewhere. The earliest documentary evidence for the church is mention of the first vicar – Walvanus in 1263. Richard III had no male heir so on his death the Cabell estates were inherited by his daughter Elizabeth. In 1693 she married Cholmeley D’Oyly who was one of 12 children belonging to a very poor Sir John D’Oyly. The marriage settlement made by Elizabeth was £10,000. Sadly Cholmeley died 7 years later and on his death it was discovered that he had already been married to a poor vicars daughter. This revelation led to Elizabeth trying to overturn her marriage settlement in an attempt to get her £10,000 back by dint that her marriage was not lawful. But in the end the marriage to the vicars daughter was declared invalid and not only did Elizabeth get her £10,000 she also incurred heavy costs for the chancery case and following appeal. Elizabeth later got re-married to a Dorset man called Richard Fownes. They had a son called Thomas who was a keen fox hunter, in fact he is said to have owned the first pack of hounds in Dorset. On the death of his parents, Richard had to sell the Dorset house in order to settle his parents debts. Having done so Richard moved back to Brook Manor. Here you have the tale about a witch riding with the Devil which is akin to the ghost rider and his hounds and the mention of a ghost coming out of its tomb on a stormy night. There is also the suggestion that the legend of Squire Cabell was the basis for the famous Conan Doyle book – The Hound of the Baskervilles. Conan Doyle met a journalist called Fletcher Robinson who told him the legend of Squire Cabell. In Fletcher’s version Richard Cabell thought his wife was being unfaithful to him so gave her a savage beating, she ran out of Brook Manor and fled onto the moor. The squire gave chase and caught up with her and in a fit of temper stabbed her to death, whereupon her faithful hound flew at him and tore his throat out. Both dog and Squire fell to their deaths. After that event the ghost of the hound prowled the moors howling piteously and reappeared to each generation of the Cabell family. Having heard this story, Conan Doyle visited Devon where both he and Fletcher drove around the moor in a coach drinking in the atmosphere and formulating the book, the coachman who drove them around was – Baskerville. Another possibility for the many legends arising from the Cabell tomb is that the stories were used to deter people from visiting the chuchyard at night. It could be that the local people spread the stories in an attempt to scare away the body snatchers or that the body snatchers spread the stories to scare away the locals thus leaving them free to carry out their grisly trade. With regard to the fires and the suggestions of Devil worship, there can be no argument that the fires were a cause of arson. As to Devil worship that although strongly rumoured has never been proven either as a cause of the fires or as rites taking place at the church. There is ‘no smoke without fire’ both in a literal sense and in fable. Repair work was carried out in 1996 when a grant of £98 from the Dartmoor National Park Authority went towards fitting the oak door. Cabell Djabri, S. 1991 The Making of a Legend, The Dartmoor Magazine No 23, Quay Publications, Brixham. Weller, P. 2001 The Hound of the Baskervilles – Hunting the Dartmoor Legend, Devon Books, Tiverton. Visited the Church today (15/10/17). I found the background information in this article very useful. I have the original key to the tomb, my husband Clive Moore asked his Grandfather Gilbert Pye if he could have it when Brook Manor was sold , late eighties. I have a key to the tomb. My late husband Clive Moore, who grew up at Brook Manor,took it from the house with his grandfather’s permission when the house was sold. 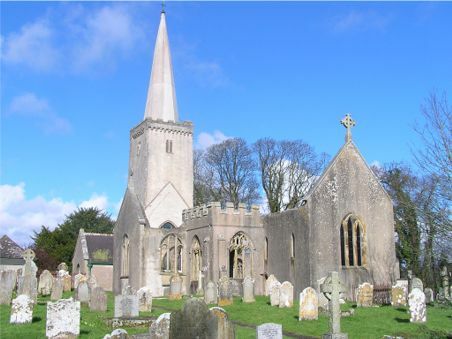 I live in Buckfastleigh and the church is one of the most tranquil spots, In all honesty, I am glad that the church burnt down as it gives Buckfastleigh a truly individual symbol and a place that is both mysterious and beautiful. I did not know about all the stories surrounding the tomb of Squire Cabell, I had always been told that the devil himself was buried there. I have lived in Buckfastleigh for ten years and the stories surrounding that church always change! However, this is a great article and some of my fellow townspeople could do with reading it! Me and my daughter decided to go there at night. We walked in and our dog was ahead of us. She started growling and barking. We stopped frozen for a moment but then heard a woman’s voice. We relaxed and walked on. As we got closer we could see through the arch via a sliver of light hooded men in black in a circle in the centre of the church. I couldn’t see their faces but the build was of men. My daughter later said she saw 3 women watching us stood in a line. It felt really ominous and not alright. Our dog and my daughter turned and ran. I played it cool and walked briefly before running too! It wasn’t till we got home and on telling the story to someone that they said maybe it was ghosts that that even crossed our minds but what was so strange was there was no noise at all. Do you know if there has been any other similar sightings?